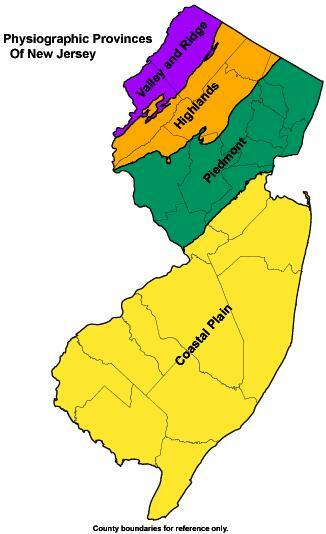 New Jersey is divided into the Valley and Ridge, Highlands, Piedmont, and Coastal Plain Physiographic Provinces. Each province defines a region in which relief, landforms, and geology are significantly different from that of the adjoining and nearby regions. The boundary between each province is determined by a major change in topography and geology, and this data set delineates the boundary lines between them. The physiographic provinces are delineated at a scale of 1:100,000. These data can be used with the state's geologic data set to break out different geologic regions when compiling or analyzing information. The state coverage is prepared for distribution as an ESRI shape file. The shape file is combined with FGDC compliant metadata in compressed 'zip' file for delivery over the Internet. The coverage is a polygon GIS data set with associated database files. The metadata file is in ASCII text format (txt) and hypertext markup language (html) format..